SOAPware DocumentationSOAPware FAQ'sFAQ's PrescriptionsQ: How do I set up ePrescribing? A: In order to set up ePrescribing correctly, look to the five steps outlined below. 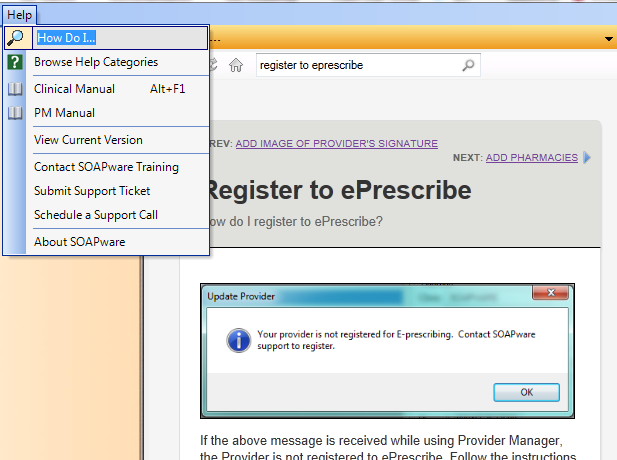 Within our new Help Manual training resource within SOAPware, you will want to access the Register to ePrescribe lesson by going to Help > How do I and type in "Register to ePrescribe" and click the magnifying glass. Click here to learn more about our Help Manual. Effective April 28th, 2016, Surescripts now requires that all newly registered Surescripts providers must complete an identity proofing process (IDP) before being granted access to submit ePrescriptions. Once you submit a ticket, you will be contacted by a SOAPware representative to help you begin the identity proofing process. There is a $150 one-time set up fee for ePrescribing and Identity Proofing. For more information on the IDP process, please see: Identity Proofing for ePrescribing. 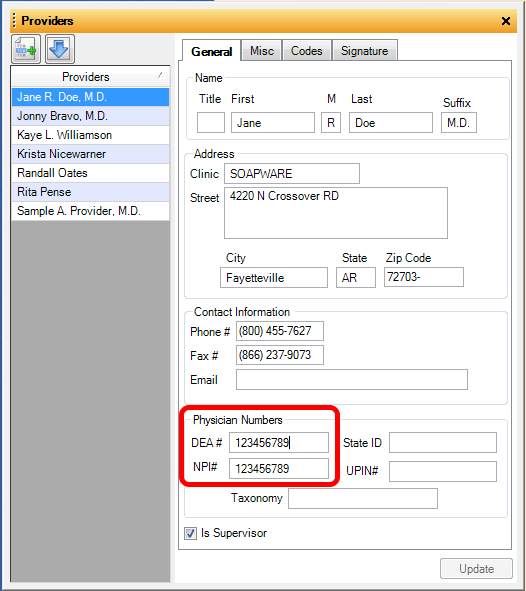 You will want to access Provider Manager (Tools > Provider Manager) to fill in the provider's DEA number among other fields for ePrescribing purposes. Please see: Provider Manager. Prior to sending prescriptions electronically or faxing to a participating pharmacy, Pharmacies must be set up in the Pharmacy Manager (Tools > Pharmacies). Please see: Pharmacy Setup. You will need to access the Options menu which can be found by going to Tools > Options. Out of the Options list, you will click on the Structured Rx option. Please now refer to the Tools- Options lesson, and scroll down to the Structured Rx- Printing- Faxing and Structured Rx- Rx Transmission sections, for further guidance. Structured medications will need to be inserted into the SOAPnote Medications field for ePrescribing purposes. For more information, see: Medication Entry. Previous Lesson: Q: Why can I not deselect a pick list item after inserting it? Next Lesson: Q: How do I change the prescription design printed or faxed from Rx Manager?